Recipe reposted with permission from Bri Healthy. It’s the holiday season, which means it’s time for holiday cookies! I’m a total dessert girl and each year around this time, I look forward to making and enjoying so many scrumptious baked goods. I love to pop on a playlist of my favorite classic Christmas tracks and dance around in my kitchen while baking up a storm. The only thing that could make holiday baking even better is a healthy and delicious cookie recipe! Lucky for you, I’ve got you covered! 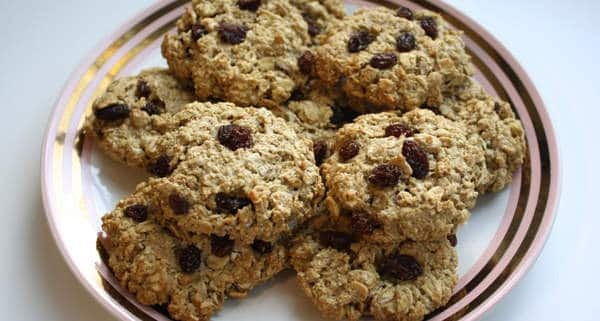 Oatmeal raisin cookies aren’t always a fan favorite, but personally, I love them. I didn’t always enjoy raisins, but now I can appreciate their juicy sweetness, and I could honestly eat them all day (although I don’t – self control!). 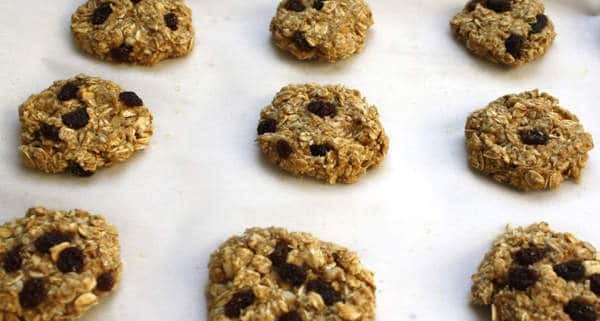 Classic oatmeal raisin cookies are delicious, of course, but I decided to make this recipe a little more… amazin’. I recently discovered a brand called Amazin’ Raisins that changed the raisin game forever. They’re fruit flavor-infused raisins that come in seven sweet, all-natural flavors: Strawberry, Sour Watermelon, Orange, Sour Lemon, Peach, Sour Pineapple, and Raspberry. They’re free of added sugars, as well as artificial colors and flavors, so you can enjoy them without guilt. They’re so sweet and flavorful, and at only 110 calories per pouch, I love to enjoy them as a dessert. But baking cookies using them makes for an amazin’ dessert too! 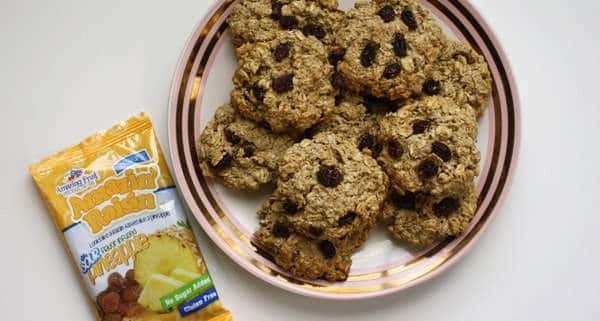 These Piña Colada Oatmeal Raisin Cookies are seriously so delicious. Eating them is like enjoying a bite of summertime inside of a holiday treat. When I first tried Amazin’ Raisins, this recipe idea immediately popped into my head. I tested them out and, lo and behold, they came out incredible. 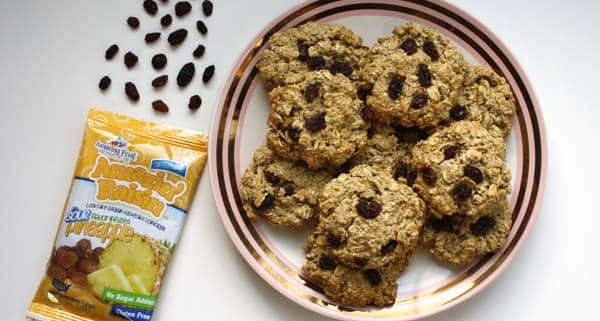 The coconut and pineapple flavors combined with the warmth of the oats and oat flour makes for a tasty, heartwarming, healthy treat. If you want even more of a tropical flavor, add some dried pineapple to your ingredients list. Tips: the dough is a bit sticky, so when you’re forming the cookie shapes, it’s helpful to use an ice cream scooper to scoop the dough into your hands first, then roll it in your palms a bit and squeeze it firmly together. Some of the raisins might fall out, but just press them back into the ball of dough and they’ll stay put. Once the balls are formed, press them onto your baking sheet with a flat hand so the dough forms a classic cookie shape. You can reshape them with your fingers to make sure all of the raisins are pressed in and that they’re round and relatively flat. These cookies are super easy to make and they’re seriously amazin’. With only about 110 calories per cookie, these are bound to be a hit in your household. Plus, they’re made with all clean ingredients, so you can feel great about eating them. You can order your Amazin’ Raisins here through Amazon, or by visiting their website. Make these soon and have an amazin’ day! 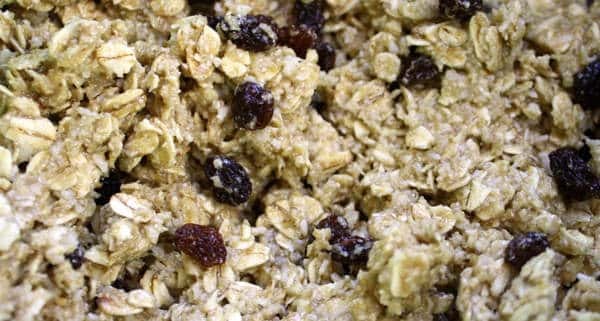 In a large mixing bowl, add the oats, oat flour, baking powder, baking soda, and pinch of salt. Mix well using a whisk. In another mixing bowl, add the coconut oil, egg, vanilla extract, and maple syrup. Whisk well. Slowly add wet ingredients to the bowl of dry ingredients, mixing while you pour. Mix until dough is formed. Fold in the raisins and the shredded coconut until it’s evenly distributed. Line a baking sheet with parchment paper and spray with olive oil cooking spray. Using an ice cream scooper (if you have one), scoop a bit of the dough and roll it into a ball in your hands. Squeeze the dough in your hands to help the ball stick together and to keep the raisins stuck into the dough. (The dough will be sticky, so it’s important to squeeze the balls of dough together). Place the ball onto the baking sheet and press down firmly with a flat palm until the dough is in the shape of a cookie. Repeat this step with the remaining dough to form the rest of the cookies. Thanks to Bri Healthy for the recipe! See what else she’s up to by visiting her website!